Counting is an essential skill that preschoolers need to practice to lay a foundation for mathematical concepts down the road. But, counting is more than just saying numbers in order out aloud. Children need to be able to rote count (saying numbers aloud) and count with 1-1 correspondence (every item they are counting gets one number). Games that incorporate these skills are the best way for young children to learn how to rote count and count with 1-1 correspondence. The games featured below encourage counting, numeral recognition and subitizing. Take a look! The best way to help a child learn to rote count and count with 1-1 correspondence is to play games! 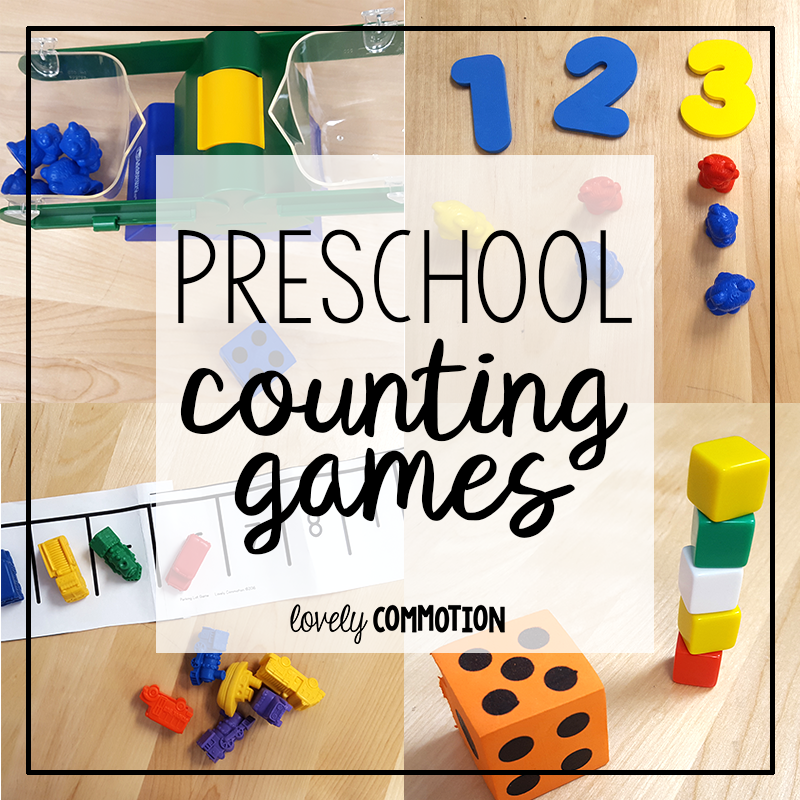 Here are some preschool counting games. Materials Needed: Counting Bears (or other manipulatives), balance scale and die. Two Players - How to Play: Each player gets a bucket on the scale. Take turns rolling the die and placing that many bears in the bucket. Now, the second player does the same. Keep playing until one bucket is full! Learning benefits: Subitizing using a dot die, counting with 1-1 correspondence and taking turns. Counting game with balance scale and counting bears. Perfect for subitizing and counting with 1-1 correspondence. Materials Needed: Numerals (foam or plastic) and counters (such a bears or buttons). One Player - How to Play: Lay out the numerals in numeric order from left to right. Student places the correct number of counters under each numeral. Learning benefits: Recognizing numerals, counting with 1-1 correspondence and placing numbers in numeric order. Help students recognize numerals and count with 1-1 correspondence with this fun game. Teacher & Child - How to Play: Show student a numeral card (write numbers on index cards). Students put a vehicle counter on that numeral. Play until parking lot is full. The parking lot game is a numeral recognition game that is a lot of fun to play! One Player - How to Play: Roll the die and stack that many blocks on top of one another. Roll again and place that many more blocks on top of the existing tower. Play until the tower tumbles. Learning benefits: Subitizing using a dot die, counting with 1-1 correspondence and fine motor skills. 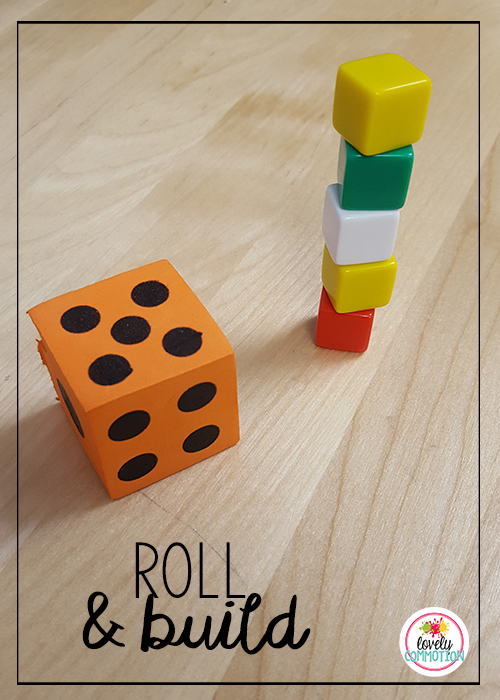 Play roll and build subitizing and counting game together and see who can make the tallest tower. What is Subitizing in Preschool? 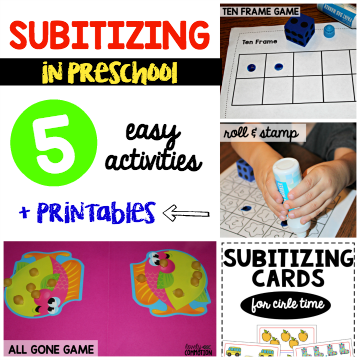 Subitizing in preschool - 5 easy activities + printables. Subitizing sounds like a big skill for preschool, but simply put subitizing is the ability to quickly identify the number of items in a small set without counting. For example, in the picture below you see 4 items. Did you have to count them or could you subitize? Research has lead to the conclusion that the relationship between subitizing and math achievement is strong. There are two types of subitizing. Perceptual: Instantly knowing how many are in a set, usually up to 4 or 5. Conceptual: You see parts of a set and put them together. For example, you might see a group of 3 stars and 3 stars. You know that 3 and 3 is 6, so you can figure out how many are in the set without counting. Obviously, subitizing is a skill we want our students to gain. But, how do we help young children learn to subitize? Here are some great activities (and free resources) to help you get the ball rolling! Ten frames are awesome because they break up the number ten in an easy to understand way. Ten frames can be used for counting, addition and subtraction. We use them with a die and counters. Students roll the die (or dice) and place that many counters on the ten frame in a left to right, up to down progression. 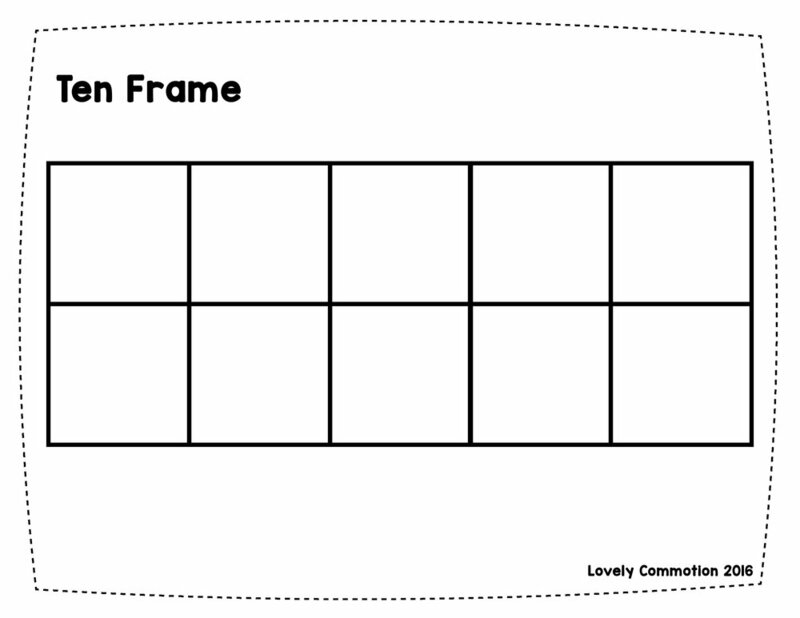 Ten frame game for the early childhood classroom. The dot cards help children learn to subitize, while the numeral cards help with number recognition. Students match the dot card to the correct numeral. Dot cards and numeral matching. Dot cards and numeral cards- free! Using a dot die (or dice), roll, find the number on the board and stamp it! You could use a dot marker, stickers or counters (such as beans, poker chips or pennies) to cover the number. This game also helps children subitize with the dice and recognize numerals on the board. Roll and stamp numeral recognition game for preschool and kindergarten. 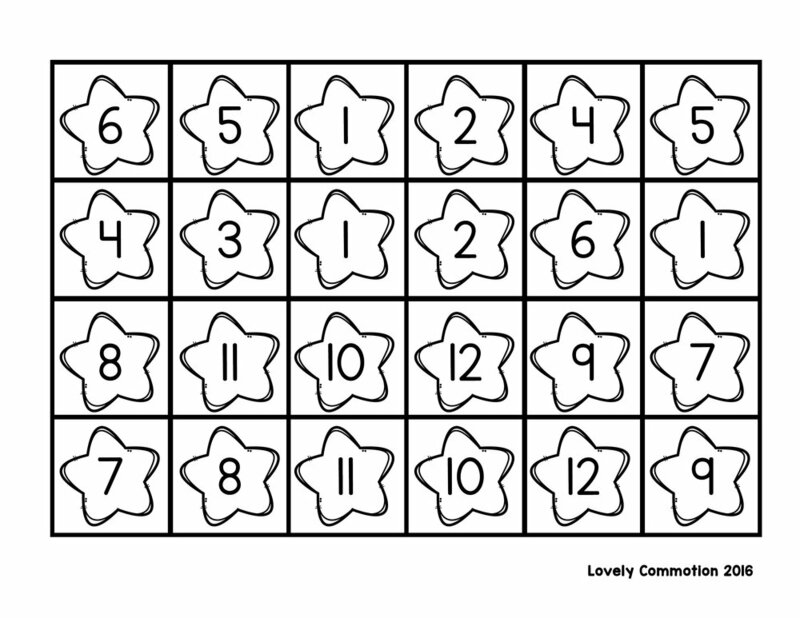 Free roll and stamp board for learning numerals. This is a fun two player game. Each player starts with 10 counters on their side of the board. Roll the die and take that many from the other player's side. Continue until only one person has counters on their side. This game is great for subitizing with the dice, counting with 1-1 correspondence and beginning to understand subtraction. All Gone Math Game for preschool and kindergarten. One way we work on subitizing as a group is during circle time using our subitizing cards. I have 3 cards for each month of the year. During circle time we look at the pictures and I ask students to help me group the objects into smaller groups for working on subitizing. For example, with 4 objects we might circle a set of 2 and a set of 2 because it is easier to combine. We talk about 2 and 2 is 4 all together. So, not only are we subitizing, we are also working on addition and math vocab. 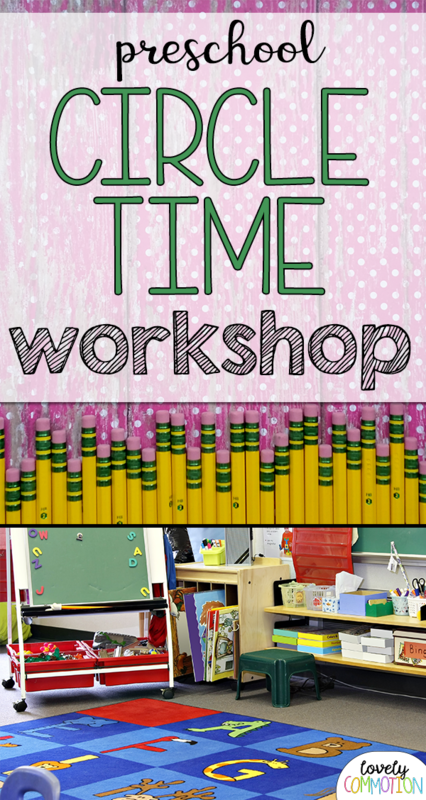 Free subitizing cards for preschool circle time. Get these subitizing cards free by clicking the picture above. Helping a child learn to sort objects is a beginning math skill. Students learn many things by sorting that lays a foundation for later math skills. Sorting helps children see the similarities and differences between objects. Children learn that objects can be organized based on their traits. We all do lots of sorting in our daily life. Sorting the laundry, when putting dishes away and putting things away around the house. Our children also sort when they help clean up items in a home or classroom. I love to bring sorting into my classroom to help students see and feel the similarities of objects. Help your preschoolers sort by object type with this fun Fall Sort! Students can sort objects using the free Fall Sort printables. For our Autumn theme I decided to create a sort with pinecones, acorns and leaves. You could easily use real objects found on a nature hunt. But, too bad for me all the squirrels got to the acorns before I did! So, I bought these mini pinecones, acorns and small artificial leaves at the craft store. Students sorted the objects by type and I even put out some pinchers to add a little fine motor practice too! See those sorting signs? Yes, I made them and YES they are free for you to use! Just print and place in front of a tub for sorting. Click on the picture below to get the sorting pages! 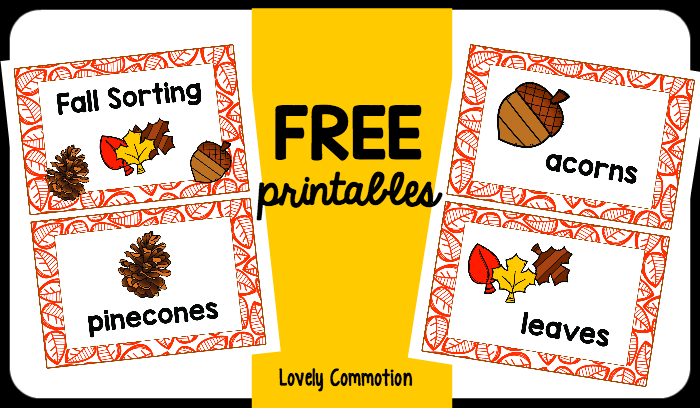 Use these Fall Sort FREE printables to get your preschoolers sorting! Bears, bears everywhere! We had a fun week learning with bears. During our bear unit, I dug out our cute little sorting bears. These bears are not only good for sorting, but also for counting, colors and patterning! Check out all the great skills practiced when working with Counting Bears Printable Mats. These mats are great for learning colors, color words and numeral recognition. This activity also helps children learn one to one correspondence, by placing one bear on each colored dot. I also love to read the sentences, pointing at each word, to model to my preschoolers how to read a sentence from left to right. Do you think you could use these Counting Bear Mats? Click here to get your free set: Printable Counting Bears Mats!